Today Dolly from the blog Cooking with Dolly so graciously bestowed on me the coveted Versatile Blogger Award! Thank you so much Dolly for this award, it really means so much coming from a fellow blogger! To me this award is a nice way to say that another blogger's, most likely in the same genre, that your work has been recognized. Hey and I am here to share no new insight on the fact that having a blog, maintaining it, being interactive on it, linking to party after party to get your blog some exposure, is a whole lota work! But I must say work well worth the effort! So thank you again Dolly for the award..it means so much to me coming from such a creative person like you. Now without further ado let tell you about the required rules for being an honored recipient! So here we go...the 7 random facts about moi!! 1. I simply adore old movies. 2. I ran the New York City marathon this past November on the day before my 50th birthday. 3.I have the absolute best husband in the world. 5. Someday I would like to publish a book. I still want Marcia Brady's Hair!!! So there it is...these are some of my favorite bloggers! Please check out their wonderful blogs...you will be amazed at the talent!! Congratulations to all awardees!!! 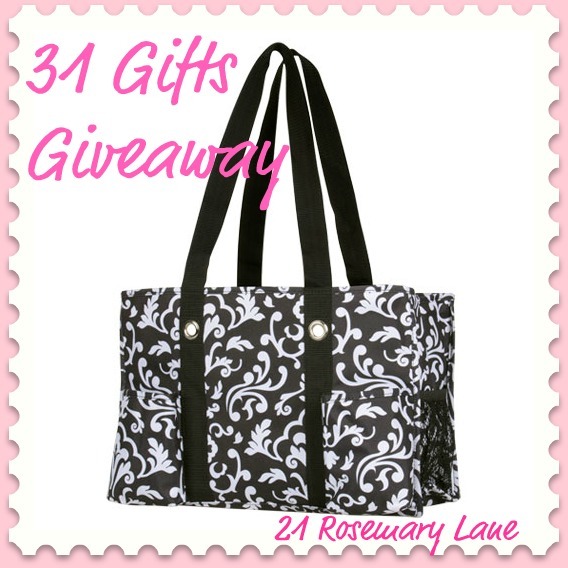 And please click here and make sure you check out the wonderful giveaway I have going on right now! 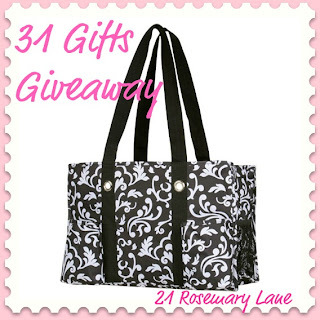 Really simple rules and you can win this fabulous tote from 31 Gifts! Good Luck and have a terrifically inspired day!!! Thank you so much for the award! I have actually already received it a while back, but forgot to post it on my sidebar. Oops! I'll try to do that now. I'll be happy to accept it from you as well. You are so kind to extend it my way. Congrats to you for receiving it as well! Thank you thank you thank you for such a sweet award! Congrats on your marathon... my hubby is a runner, however... if you see me runing call the police... I'm being chased. Oh Barbara, aren't you the best? Thank you for this flattering recognition. I always love the things you link up to Motivated Monday. I am assuming that our tastes are rather similar and it so is easy for us to find things on each other's blogs that inspire us. How fun to read little tidbits about you that make me feel like I know you just a little bit better. I will mention the award and your giveaway tomorrow on my blog but it may take me another week or so to select fifteen bloggers to pass it on to. Thanks again for making my night. Thank you so much for passing on the award! I'm looking forward to spreading the love! Congratulations and Thank You, as well! I will be posting this on my blog soon and I'm really appreciative that you thought of me enough to give this to me with all the other great blogs you've chosen to honor too!